The AcuteBand Pre-stained Protein Ladder is a protein standard designed for SDS-PAGE and WB covering a molecular weight range of 6.5 - 270 kDa. The ten marker proteins are pre-stained with one of three different colors for extra-easy visualization. 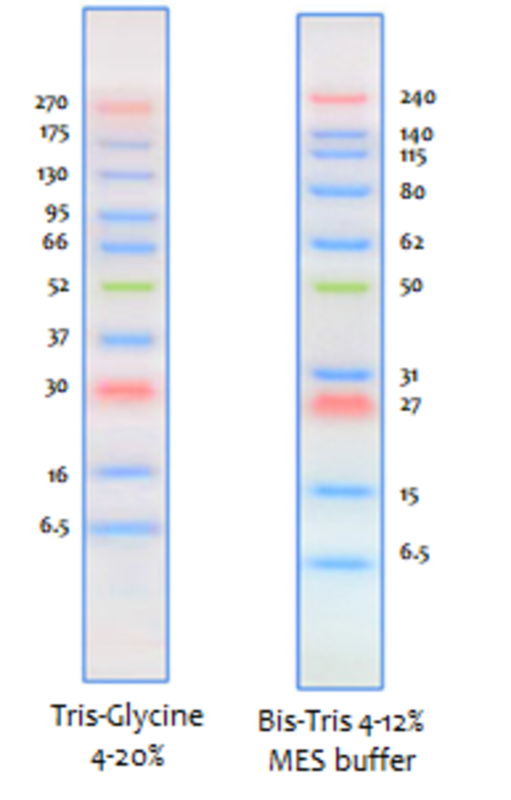 This protein ladder is also ideal for Western Blotting with the LICOR system: the markers are bound by the secondary antibody, making them clearly visible! Like Coomassie Blue - only simpler. QuickBlue is a one-step protein gel dye that provides you with clear, sharp bands with virtually no background - in 15 minutes! Destaining is not necessary. QuickBlue can be stored at RT, used up to three times, and is safe to dispose down the sink. Also 100% compatible with mass spectrometry analysis. SureBlock is a high capacity, bovine gelatine-based blocking agent used for various applications, including Western blot, Dot blot and ELISA. Compared to BSA, it is more economical, has a higher blocking capacity and shows virtually no background. 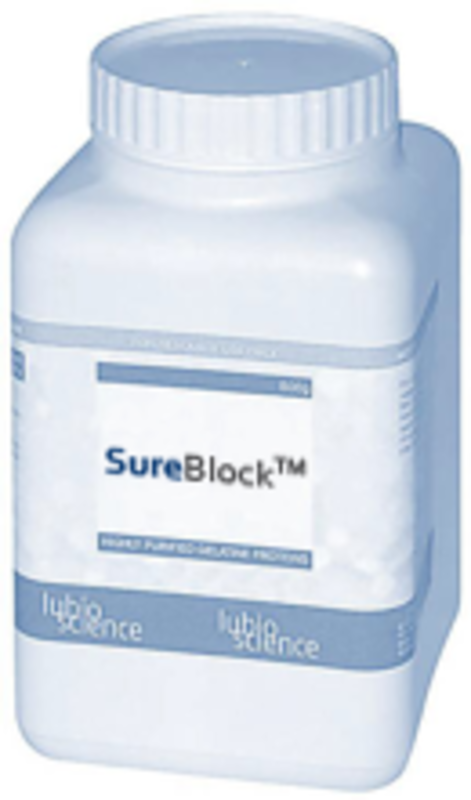 SureBlock is available in different-sized packs. Pure distilled water - free from ions, trace elements and general contamination. The allrounder in every research lab. The SmoBio ExcelBand 1KB Plus DNA Ladder is a ready-to-use DNA ladder that covers DNA fragments from 0.1 to 10 kb. As it is already pre-mixed with loading dye, it can be loaded directly onto the gel. This ladder is composed of 19 individual DNA fragments and three enhanced bands (3 kb, 1.5 kb and 500 bp) for easy referencing. Further, three tracking dyes (Xylene cyanol FF, Bromophenol blue and Orange G) allow real-time monitoring during electrophoresis. 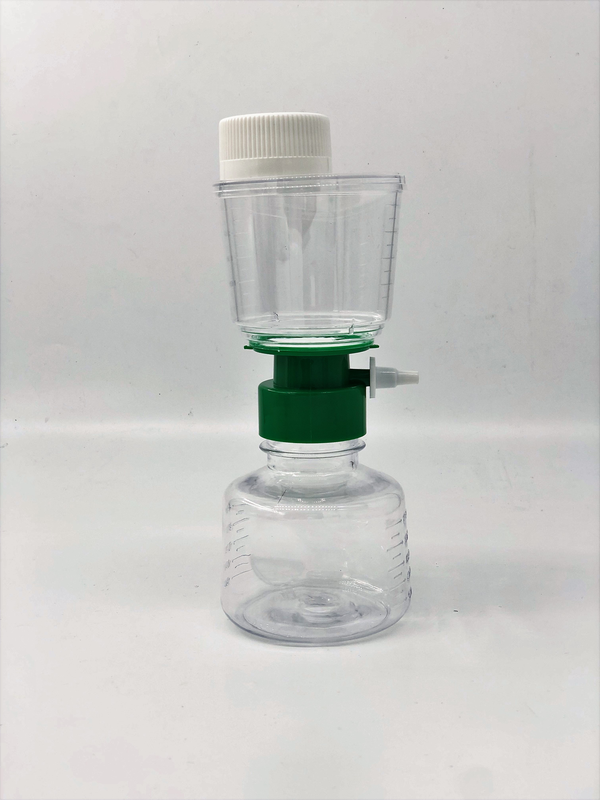 VacufilTM Disposable Vacuum Filtration Units are used for filtering and storing cell culture and tissue culture media, biological fluids and other aqueous solutions. VacufilTM guarantees sterile, as well as pyrogen- and detergent-free filtration. Available in two pore-sizes (0.22 µm and 0.45 µm), with or without receiver bottle (500ml). They also feature a PES membrane, offering fast flow rates and low protein binding rates. 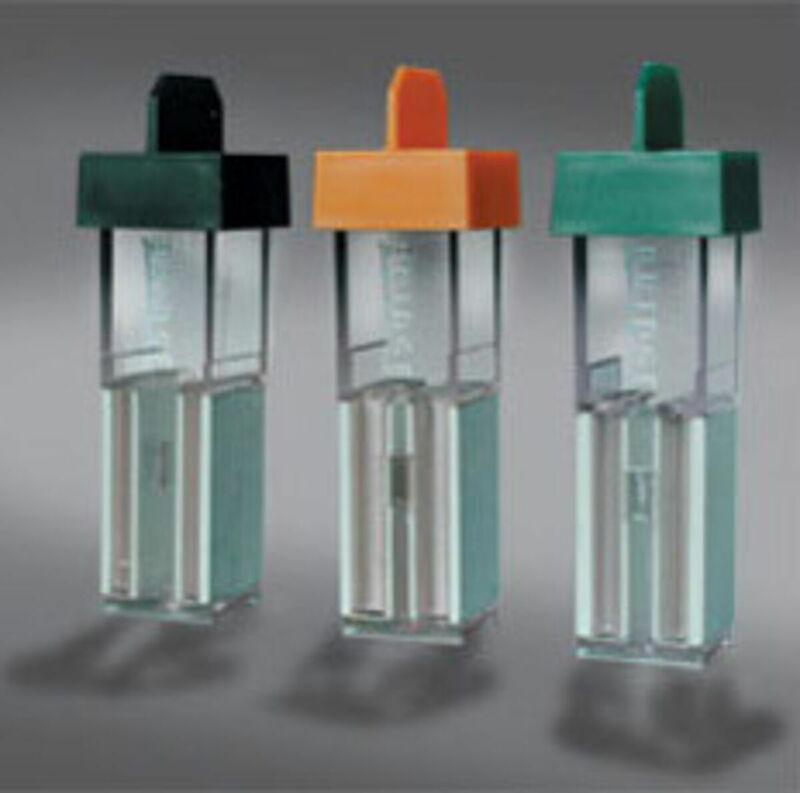 These sterile syringe filters consist of PES membranes with a polypropylene (PP) housing. The PES filters (in pore sizes 0.22 µm or 0.45 µm) provide reliable sterile filtration with high flow rates and a large filtration area. They also present low protein adsorption and are compatible with a wide range of applications, including filtration of protein solutions, culture media and additive solutions. Electroporation cuvettes efficiently transfer DNA and siRNA into a wide variety of cell types. Our electroporation cuvettes meet and exceed every measurable qualification and parameter, ensuring consistent pulse delivery and reproducible results. They fit in most electroporation systems (including those from Bio-Rad, BTX, Lonza/Amaxa (Nucleofector 2b only), Invitrogen, Eppendorf, and Kodak/IBI). Our cuvettes (with 1, 2 or 4mm gap) offer a great replacement to conventional brands' products - providing you with the same quality for a lower price. IPTG is widely used to induce the expression of proteins unter control of the lac operon. As IPTG cannot be metabolized by E. coli, its concentration remains constant throughout the experiment. We offer ultra-pure (crystallization-grade), dioxane-free IPTG (>99.5% purity) at an affordable price.